Playing around in my mind was the comment that I had quoted about Debbie New being the "Salvador Dali" of wool. (I have posted about Debbie and her art in the medium of knitting in earlier posts.) I was puzzled by these comments partly because, I knew very little about Salvador Dali and partly because I know, I will never know a lot about Debbie New! When you divine that well of creativity, do you ever actually find the bottom? Anyway, I consulted Wikipedia for information about Salvador Dali. Well if ever there were a study in opposites, it is Salvador Dali! He's the artist who often depicted "soft" watches that draped over things in his paintings. 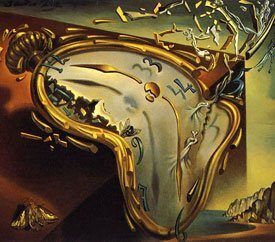 Critics suggest that Dali was making a statement about the rigidity of time. Perhaps suggesting that through Art we do not have to be bound by the realities of this world. I have to believe that there is something in the creative spirit that objects to restrictions like time, gravity - all that science "stuff". Possibly this is why the watches (or teacups - from Debbie New) melt; the rigid structures of this life have no substance, if we decide they don't, in the surreal world of the imagination. We accept the earth as we know it, to survive; but we challenge its laws in our art. 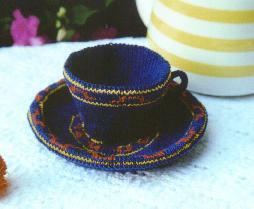 We knit teacups from yarn - these will never hold tea - but they will hold things that are much more important - ideas, love, memories. We paint watches that - slip, slide away - do we really want to know what time it is, when we are dealing in decades, centuries, millennia or when we are experiencing through our knitted Art all that is grand and enduring? We knit lace that was designed hundreds of years ago, (as Barbara Walker often says - patterns of great antiquity.) We knit jewellery - with yarn as rich as a precious metal? We knit bird houses or Flamingos, if this is our escape. We knit the amazing, design the impossible, to say what has to be said, or knit what has to be knit, before the watchman cometh. Create something enduring and he may never come. Once again - great post and so thought-provoking.